The Coordination of Care Initiative team leader was Megan Williams, FNP-COPC, Director of Population Health. Other team members were: Dianne Bane, RN, Andrew Lightfoot, Linda Sapienza, RN, and Beth West, RN. 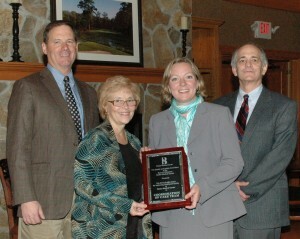 Pictured here, left to right, are: Dr. Fanto, Dianne Bane, Megan Williams and Jeffrey M. Fried. 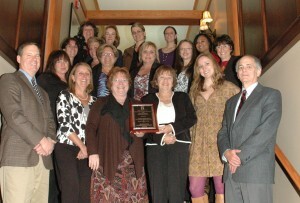 : Hand-Off Communication team leader was Margaret Porter, RN, Nurse Manager of the Third-floor Medical-Surgical Unit. While all members of the unit have taken part in the initiative, the original eight core team members were: Amy Balasus, RN; Tara Bower, RN; Linda Butts, Jen Gray, Colleen Murphy; Joanna Robertson, RN; and RN; and Michelle Robertson. Pictured here are nurses from the third-floor medical-surgical unit who are among the nearly 100 nurses actively participating in the initiative shown with Dr. Fanto and Mr. Fried. Medical Staff Quality Measures team member and presenter was Rochelle Spriggs-Hall, RN, BS, BSN, Medical Staff Quality Coordinator. Other team members were: Vikas Batra, MD, (Chairman); Ellen Bahtiarian, MD; Gregory Bahtiarian, DO; Steven Berlin, MD; Mouhanad Freih, MD; Nancy Gideon, MD; Joydeep Haldar, MD; Jeffrey Hawtof, MD, FAAFP; Michael Ingerski, MD; Paul Minnick, RN, MSN, NEA-BC; Richard Palmer, MD; Ronald Sabbagh, MD; Michael Salvatore, MD; Ann Smith, RN, BS, CPHQ; and Kristie Zangari, DO. 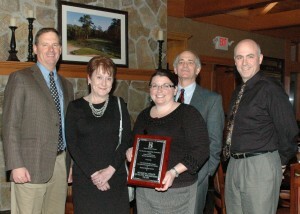 Shown here, left to right are: Dr. Fanto, Ann Smith, Rochelle Spriggs-Hall, Mr. Fried and Dr. Hawtof. Beebe Medical Center recognized employees and physicians for their dedication and commitment to high quality patient care during the 3rd annual Quality and Safety Awards Banquet recently held at Kings Creek Country Club. • “Coordination of Care Initiative” – which implemented actions to improve and maintain the health of patients with chronic illnesses such as heart failure after they are discharged from the hospital. The evening represented the culmination of a year’s work by 11 teams made up of a total of more than 75 Beebe team members that had designed and implemented process improvement initiatives impacting the quality of patient care. A member of each team presented information on each project. Stephen Fanto, MD, Chairman of the Board of Director’s Quality and Safety Committee, then officially recognized the three winning teams by presenting them with their awards. “Beebe Medical Center is an excellent hospital with exceptional people,” said Jeffrey M. Fried, President and CEO of Beebe Medical Center. “We set very high standards for ourselves at Beebe and establish our goals with the intent of being among the very best hospitals in the United States. In his remarks, Mr. Fried noted that according to the new federal quality rating system of hospitals - “Hospital Value Based Purchasing,” Beebe Medical Center’s 73.3 rating was 32% higher than the national average of 55.5, and 53% higher than the Delaware hospital average of 47.9. “Healthgrades gave Beebe Medical Center more 5-star ratings for quality than any other hospital in Delaware,” Mr. Fried added. • Treatment of patients with pneumonia, chronic obstructive pulmonary disease (COPD); and sepsis. The findings are part of American Hospital Quality Outcomes 2013: Healthgrades Report to the Nation, which evaluates the performance of approximately 4,500 hospitals nationwide across nearly 30 of the most common conditions and procedures. The 2013 performance outcomes are now available free to the public at www.healthgrades.com. • Scabies Initiative – Developed and implemented controls to avoid the spread of the scabies infection that is brought into the hospital by infected patients.